We were stunned upon discovering that Palm Springs had a bigger cluster of nearby hiking trails than absolutely any other place we'd been in the US. The title of a book said it well: "140 Great Hikes In and Near Palm Springs." We moved to an RV park that was a 20 minute walk or less to 2 trailheads that gave us serious fitness workouts. And 1 of the 2 trails had ready access to the much-mentioned Skyline/Long Valley Trail that dishes out 8,300' in elevation gain and ends at the tram. But heading for almost any hill hike in the area quickly delivers 1000' in elevation gain or more. Who knew?? A palm oasis swamp. 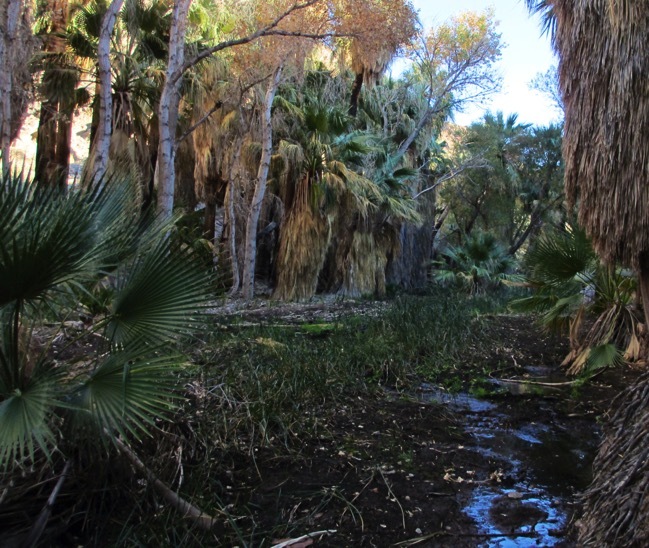 The desert scenery is nothing special on these Palm Springs hikes, in part because the area was in its 3rd year of drought, but they are authentic, outdoor trails. And we did come to appreciate the nuances: the fine granite-grit surface on the Art Smith Trail was especially nice for jogging; the palm oasis swamp at the trailheads in the Coachella Valley Preserve was like nothing we'd seen before; and some trails had more interesting rock formations than others. Besides, hiking in warm, dry, sunny weather in early January was a treat no matter how spare the scenery. 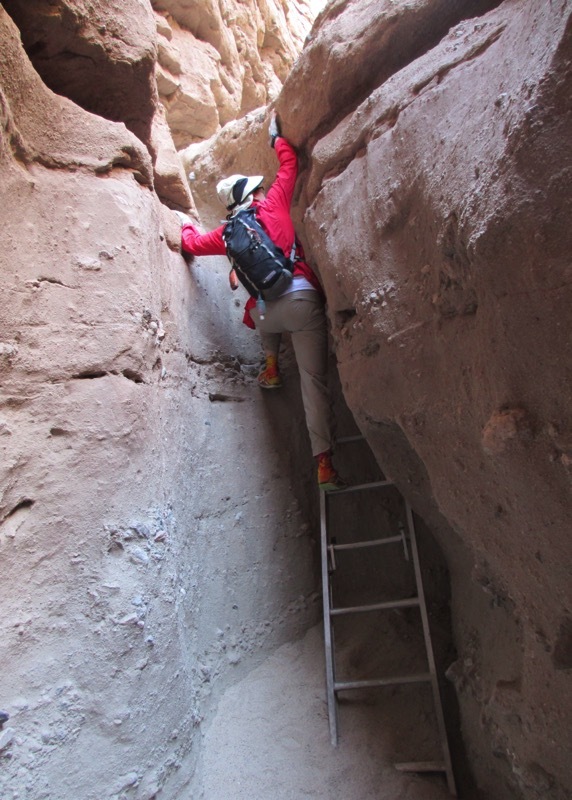 And the walks up washes to fascinating canyons were more rewarding than in the washes of Death Valley because the footing was more comfortable and the canyons more dramatic. The to-die-for winter weather turned our brief stay in Palm Springs into 2 months. The usual winter high is about 66° with overnight lows in the 40's. Our first night was below freezing and the daytime highs were proportionately lower as well. Overcast skies and some sprinkles dampened our enthusiasm for the area initially and then the weather turned. A week of typical weather begat weeks of lovely days in the mid-70's that climbed into the 80's with generally inconsequential winds. It was silly to go anywhere else for hiking and biking because this became the winter of one arctic blast after another. We learned new terms like "crawling ice," "sound-effect snow" (like lake-effect snow), "lake effect blizzard," "rarefied air of the polar vortex," and "frost quakes" through news coverage of other people's misery. So we stayed and stayed some more to hike and bike. We felt guilty for not traveling and exploring but settled upon viewing ourselves as participants in an off-season training camp rather than as travelers. For our friends in the soggy Pacific NW looking for a quick mid-winter hiking get-away in the sun, Palm Springs could be a perfect destination, as long as they aren't looking for stunning scenery. The airport is in the middle of the urban sprawl and only a few miles from the central downtown area of Palm Springs itself. Motels and hotels are plentiful in the downtown core and the Museum Trail trailhead is literally behind the main shopping district at the art museum. One could manage a short stay without a car by taking a taxi or shuttle to carefully selected downtown lodging from the airport and walking to the beginning of Museum Trail. It's a steep trail that intersects with the North Lykken Trail as well as connecting with the Skyline/Long Valley Trail that goes to 8600'. You could have a long "go thrash yourself" hiking weekend in Palm Springs with little time spent on transportation once arriving by air. And the Art Museum happens to be at the Museum Trail should you want a break from hiking. 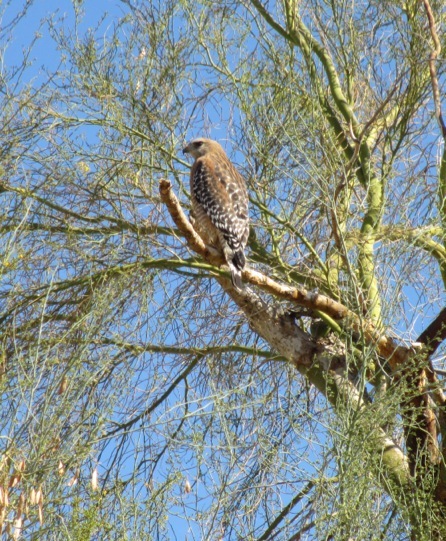 You won't be seeing a lot of wildlife on the trails. If you'd like to visit Palm Springs for hiking and not rent a car, use the Palm Springs Art Museum address as a reference point for checking distances: 101 N Museum Dr, Palm Springs, CA 92262. One must pay attention to the details when looking at maps and addresses in Palm Springs because some tourist maps aren't to scale; places in adjacent Cathedral City call themselves "Palm Springs _____"; and then there seems to be the word "Palm" or "Canyon" in too many names. "Palm Canyon Drive," including "North," "South," and "East," and "Date Palm Drive" can easily be jumbled if you are in a hurry. So if you are looking for motels close to the Museum Trail trailhead, check the distance from the art museum address before clicking "Buy". Also note that there is a Palm Springs Art Museum in Palm Desert, which is many miles away. Here is a site with a listing of Palm Springs hotels offering airport shuttle services: http://www.palmspringsca.gov/index.aspx?page=287. The Sun Line bus system's bus #24 appears to stop at or near the airport but doesn't seem to go all the way through the main downtown area of Palm Springs so you'll need to do further research before taking the bus from the airport. Palm Springs, especially on the west side, is a great location for hikers. If you visit the Coachella Valley for any other reason, like golf or shopping, the other cities such as Rancho Mirage, Palm Desert, or Cathedral City might be better destinations. Palm Springs has been in decline for years because of the competition from these newer communities but it's still the place to be for many hikers, long or short stay, because it is slammed against the mountains. That being said, an experienced thrift shop shopper told me that the Revivals Resale Mart at 611 S Palm Canyon Dr, Palm Springs and near the Happy Traveler RV Park, is a top-notch second hand store for mens clothes. Palm Springs is a very popular first and second-home location for gay men and apparently this is the preferred donation center for some of them. She commented that the women's clothing section was tiny but many, many trophy-finds were available for slim men. (We learned of this after leaving Palm Springs but will check it out in 2015.) She said that the other thrift stores in Palm Springs were also better for mens wear than in the neighboring cities. A well-advertised place to hike in Palm Springs is Indian Canyons but "Indian" is the operative word, as in tribal lands, as in 'pay to play.' It's $9 per person or $7 per senior to visit the site. It has a lovely palm oasis and a network of trails but many free trails are available elsewhere in the valley. By chance, we visited Indian Canyons on one of the 2 days a year that they only charge $5 per car. The discount applies for Christmas Eve day and Christmas Day only. I doubt that there is bus service to Indian Canyons and it's too far away from anything to walk to the entrance. If you are going to Palm Springs for more than a short get-way, then you'll probably want to rent a car to visit places such as Indian Canyons. Cycling should have been good in the greater Palm Springs area because it is flat; many of the roads have multiple, wide lanes; and there are several posted bike loops. But disappointingly, it was far from joyous riding. "Share the Road" hasn't caught on and one 30-something Hispanic woman felt it necessary on a Sunday afternoon to honk her disapproval of us several times and lecture us as to how we "should get off the road because you are going to cause an accident." Not much to say to that retro attitude unbefitting her years. Some drivers were meticulous in their care of us on the road but a disturbing number of drivers had severe tunnel vision and never saw walkers or bikes several feet from them. And coming from the land of 'hands free driving' we were distressed to see how many drivers had a hand (and once, both hands) occupied with their phones while rolling along. Especially as newcomers in town, traffic lights were particularly difficult because pavement sensors were often lacking in the left turn lanes on broad boulevards that bikes could active, leaving us stranded behind red turn lights at intersections. We rode 20-30 miles several times but lamented how much better the outings could have been if a pro-biking culture was more entrenched. In fairness however, even though the region promotes cycling as an activity, no where did they claim to be a bike-friendly city. As cyclists, you have basically 2 strategies to choose from. You can do what we did and learn the maze of short bits of bike path and bike lanes to slowly but safely navigate to markets and other destinations or you can take to the streets for long, fast rides. Palm Springs and the Coachella Valley area are generally flat, as verified by the number of single speed bikes with balloon tires. But there are plenty of opportunities for mountain bikers and road riders to get their hearts pounding. A couple of obvious steep roads to get the quads burning are the road to the Aerial Tram at the far north end of Palm Springs and Hwy 74 that turns off the highway through Palm Desert and heads towards Idyllwild, which actually has bike lanes part of the way. Mountain bikers in our RV park were fond of the trails up towards Murray Peak that are accessed by parking on the eastern end of Von's grocery store in Cathedral City. Online searching quickly brings up biking clubs that share their routes and welcome visiting riders on their group rides. Amazingly, Palm Springs is sometimes a destination for short cross country skiing and snowshoeing excursions. It of course all depends on the weather and it wasn't happening the winter of 2013/14. The Mount San Jacinto State Park at the top of the aerial tram is the location of the tracks and equipment rentals are available there. Renting a car would likely be cheaper than cab fare between your lodging and the lower tram station. Dogs are allowed on some hiking trails in the area, like the North & South Lykken trails in Palm Springs. They aren't allowed in the big horn sheep habitats, at the Coachella Valley Preserve, or on the aerial tram to the 8600' elevation point above Palm Springs. The "140 Great Hikes" book includes an appendix listing the many dog-friendly hikes. Ladders Canyon is in the book. The single best hiking map for the area is "SantaRosa & SanJacinto Mountains National Monument Trail Map" for about $9. We purchased ours at the Monument's Visitor Center uphill from Palm Desert on Hwy 74 near the Art Smith Trailhead. The best local hiking book is "140 Great Hikes In and Near Palm Springs" by Philip Ferranti. All of the area hikers emphasized that this book was a "must have" but that it was terribly written and they were right on both counts. The author makes annoying comments like 'the distances on each hike's spec sheet are either one-way or round trip' but then he leaves you to deduce which it is by reading the route details. And looking up a trail in the index by its name often leaves you empty-handed; instead you sometimes need to know its alias, like "Cactus to Clouds" which includes the Skyline/Long Valley Trail. But it is an excellent starting point and is THE reference point when talking with other hikers. http://www.sunline.org for the Sun Bus serving Palm Springs and Coachella Valley. It's only 50 cents for 60+ to ride, $1 for others. www.pstramway.com The Palm Springs Aerial Tram is about $25 RT and takes you to an 8,600' pine forest which is a welcome break from a long stay in the desert. You can go to cool-off, to dine, or to hike to the 10,800 summit of Mount San Jacinto. The summit is 11+ miles RT; 2,100-2,500' gain (depending upon who is doing the measuring); and a moderate hike except for the zinger of the thin air. It was about a 10 mile, 20 minute drive from the Happy Traveler RV Park in Palm Springs to the lower tram station; no city bus service is available to it. The $12, one way tram ticket down allows hikers to do the 8300' gain, 10 mile hike up from Palm Springs without the need to walk down, which is a rare opportunity. The very ambitious combine the 2 hikes for 22 miles and over 10,000' gain. This "Cactus to Clouds" hike is often started and finished in the dark. The 9:45 pm 'last car down' tram schedule allows for late finishing hikers. You can "pee for free" at the Hyatt Hotel in the heart of downtown Palm Springs at 285 N Palm Canyon Dr. According to the nice man at the nearby Chamber of Commerce, the Hyatt's restrooms are partially subsidized by the city for use by tourists, so barge in with no apologies like we did. Other tourists we spoke with helped themselves to the coffee shop toilets without making a purchase. If it looks like it will be hot during your hiking vacation to Palm Springs, be sure to bring plenty of light-weight, light colored clothing and a brimmed and ventilated sun hat. The south facing trails like North and South Lykken can be brutally hot and initially devoid of any breeze. We also found that we had to increase our sodium intake by 500-1000 mg/day to avoid lightheadedness and weariness from excessive salt loss due to the heat and exertion on the steep trails. (In terms of table salt, we increased our intake about 1/4-1/2 tsp per day). The backs of our shirts were stiff and had white rings of salt under our packs from considerable sweating we did in as little as 1 hour of hiking. Keep in mind that the afternoon temperature drops precipitously in Palm Springs during the winter. When the official sunset was about 5 pm, the sun dropped behind the mountains for those of us at their base on the west side of town around 3:15, and with it the temperature. On hot days on the trail, the drop was welcome and there was still plenty of light for descending, but the sudden chill in the air was fair warning not to be caught late on the trails. In contrast, if you take the tram up to San Jacinto State Park, be prepared for at least a 30 degree temperature drop compared with the valley and additional chilling from the wind. Remember, they sometimes ski there in the winter and you don't want to be among the many tourists shivering in shorts on a windy, 40 degree day. Bring your meds if you are prone to hay fever. I usually only worry about allergy issues in May, June, and July but in January the tree and weed pollen counts were high in Palm Springs. Very cramped sites but with hedges between units affording significant visual privacy. No traffic noise. Sheltered from the worst of the area's considerable winds. Generally a happy, social crowd that can be called upon for help with repairs, hiking suggestions, and the like. Long-stay regulars will connect you with others who have similar interests to yours. The club house opens at 6 am and is available for exercising (no equipment provided). Cable TV hook-ups, marginal (Tengo) wifi, inexpensive laundry room. Easy walking distance to 2 trails up the mountains. Walking distance to downtown and 2 large grocery stores (3.5 miles RT). We stayed here almost 2 months in 2014. Visited but didn't stay here. Off the road, so should be quiet. Spacious, with some trees (it's an old KOA). There is no cable TV hook-up. Must drive to all trailheads (6 miles from north end of S Lykken). On a bike path. Top pick for 360 degree sunrises and sunsets; large, open slots; terrible showers (1 of the 6 shower heads in the women's 2 shower houses delivered a hot shower); pay an extra 10% to have a site with less traffic noise; club house not suitable for exercising. Cable TV and marginal wifi. Must drive to all trailheads (7 miles from north end of S Lykken). These, and most RV parks/resorts, are considerably cheaper if you pay by the month. Happy Traveler does not prorate, making stays of other than 30 day increments painfully more expensive. Peak season pricing is January-March with the peak-of-peak being February. Extra charges apply at Cathedral Palms for February. Don't expect to stay at any of these 3 parks in February without advance reservations.